I think that bedtime is particularly hard for teachers. Not for the teachers who are strict disciplinarians, of course. I know that there are some educators who send their children off to bed and don’t hear another peep from them until the civilized hours of eight or nine in the morning. No, bedtime is most difficult for those of us who got into teaching because we love the sharing and discussion of knowledge. Bedtime ends this sharing and discussion. Our little ones know of our love of knowledge—and they quickly learn how to exploit it. Take the other night. I was next to my four-year-old, rubbing his back as he tried to go to sleep. His mind was on other matters. “Where will Zachary go to robot camp?” he asked. Don’t answer, I told myself. Don’t answer. What a great thought! He thought it would be at a camp, and of course he was confused that it was at a school. This would be a neat time to talk about how our ideas can change. I wondered what he was picturing in his mind when he thought of robot camp. Don’t answer, I reminded myself. It was so hard to keep quiet. But it was past 10:00. Oh, the conversation we could have had. What a question. How to explain it to a four-year-old? Where would I begin? The etymology of the word school, and its origin in Greek? The schoolhouses of early America? I would begin nowhere, I reminded myself. This was not a conversation that we were going to have. It was bedtime. He decided to take a different approach. “What’s that?” he asked, pointing to an electrical outlet. I had fallen into the trap and answered the question. “We could plug things in there?” he asked. “Like our new vacuum cleaner?” he repeated. “LIKE OUR NEW VACCUUM CLEANER?” he said, a third time. He was silent for awhile, and I thought that maybe he had fallen asleep. Silly me! “Mama, what if a little elephant gets into the bedroom?” he asked. I didn’t say anything, but sighed loudly. I sighed again. Where was this coming from? How did he get from the vacuum cleaner to an elephant? I realized then where this was going. And I saw that my resolution to say nothing was pointless. I was going to answer. He knew that I couldn’t resist. He had me. “That’s right!” he crowed. “You did it, Mama! Good job!” He burst into a little song about how we would use the vacuum cleaner to clean up the mess from the elephant. There was silence again, followed by yet another question. “Why did the little elephant come in and make a mess?” I asked. “What kind of mess was it?” I tried, because I really did want to know what he was picturing in his mind. “Mama,” he said, “’top asking questions. I am trying to go to sleep.” And then he breathed deeply, snuggled down, and closed his eyes. I sat there, wide awake, thinking about the little elephant who left a mess on the floor, wondering about the story there. Why would the elephant come into the bedroom? Why would it fly so quickly out the window? What is the lesson to be learned? Tomorrow night, I resolved, my husband would be in charge of bedtime. 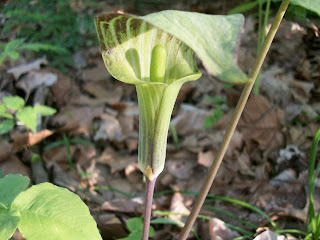 Finding a jack in the pulpit is always a treat. Near Mount Holly Springs, on the way to Kings Gap, we discovered a little township park that has a path lined with these flowers. 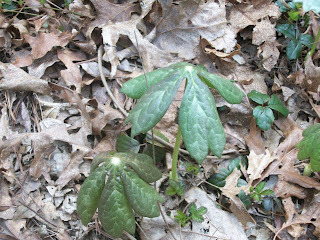 From hepatica to marsh marigold to jack in the pulpit...springtime is amazing in central Pennsylvania. One of the reasons why I decided to stay in fourth grade instead of transferring back to sixth is that end of the year fourth graders are such a delight. At the end of sixth grade, with approaching adolescence, the students are trying to make a break with childhood. For many of them, the best way to do this is to make a break with adults and adult authority. This makes the last few weeks a difficult time, to say the least. Just when we want to celebrate and recognize our students, they go and pick fights. But end of the year fourth graders are another creature entirely. They have come through the difficult transition from third grade to fourth grade and emerged, self-confident and ready for the world. Abstract ideas that were once beyond them are now within their grasp. They have begun to understand that there is a world beyond their family, beyond their school, and they want to know more. They can now appreciate subtle jokes and gentle sarcasm. 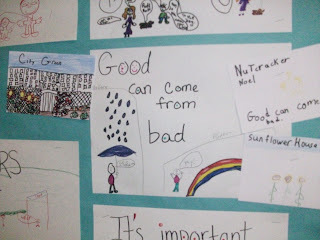 The new maturity of fourth graders is a bit of sunlight in the gloom and doom world that I often create for myself at the end of the year. May and June are always times of great guilt for me. The units I haven’t covered! The papers I haven’t graded! The anguish of it all! This week, I observed something that changed my thinking. A student was at the front, sharing a piece of work, when I had to help another student who was taking an assessment. It turned out that the student needed quite a bit of help. I took some time, working on the question, when I realized what was happening at the front. The first student writer had finished. She had answered two questions from other students about her writing. Then she said, “Who else would like to share?” Another student came up to the front. I stayed at my desk, just to watch what developed. The student shared his writing and asked for questions or comments. Eager hands went up, and questions and comments (all related to writing!) flew back and forth. “Who’d like to share next?” the student said, and yet another student took his place at the front. What a moment. I was at the back of the room, but the community of writers kept sharing, kept talking. The conversation had not strayed, the students had not sat there chattering as they tried to figure out what I wanted them to do next. I was no longer a necessary part of their sharing. They could do it all on their own. So now, when the end of year guilt tries to overwhelm me, I think of that conversation. And I begin to realize that, despite all of my mistakes of this past year, a few things must have turned out right. I've worked with my students to put sticky notes to record their ideas as they read, and we've made all kinds of charts to collect our thinking and map our ideas. "love that dog" is a writing journal written by a student named Jack. He responds to various poems that his teacher is teaching in class, which leads to neat instruction, as the students and I can share the poem, react, and then see how Jack reacts. Well, we were reading "Stopping by Woods on a Snowy Evening" when one of my students raised her hand. "I have a connection!" she said. "The kid's name is Jack, and this poem is written by Robert Frost, and when you put Jack and Frost together, you have Jack Frost!" Sigh. When I work with my students to move beyond word calling and into connecting with text, I hear a lot of these kinds of comments, questions and connections and ideas that a more skilled reader would repress. In the same lesson, one of my students shared a question: "Why is the horse wearing bells?" Keep in mind that these are not coerced responses, written because I forced students to fill lines on a paper. These are their real, honest contributions to the conversation. What’s a teacher to do? On the one hand, these kinds of connections can pull a reader away from the text. On the other hand, this student was really trying to make a connection. What I did for my student was to honor her thought--"Wow, you're really pulling on some background knowledge to make a connection"--and try to move her to different thinking--"But do you think that that's important for understanding the text? Let's read on and see." After a careful reading of the poem, she said that the Jack Frost comment didn’t really relate. But I made sure that she was the one to make that decision. I used to get very frustrated and feel that these comments reflected badly on me and my teaching. But now I realize: They're thinking! They're coming to the party! They're trying it out! What more can I ask? These misfires are a natural part of the process for students who have looked upon reading as just saying the words. Now they're trying a new process, and it's a lot to coordinate all at once. As students move from my lesson and into their independent books (ahh...peace and quiet! ), I have the same issues. Sara's working on "Wanderer". As I talk with her about it, I notice that she has missed some of the big ideas. The book's a stretch for her, and I'm glad that she's giving it a try. And she's understanding some things, like the different voices of the two narrators and their reactions to the journey. Her experience with this book, even though she doesn't have full and complete comprehension, will inform her reading for future books, and she'll get there. She’s developing a taste for the stories that yield their secrets slowly. To force her to move to easier books just because she hasn’t coordinated the process yet would be a step in the wrong direction. So, when students toss out those crazy responses, think about where they might be coming from. Is the students honestly trying to attach meaning to the words in the text? If so, don't be discouraged. Help the student to discover for herself whether the thought she shared will help her to understand the text. A few weeks ago, while crisscrossing between PA 94 and 194, we found a small area near the Conewago Creek just covered with marsh marigolds. 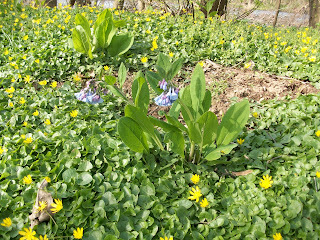 They bloomed all around, forming a yellow carpet with their bright flowers and waxy leaves. What a neat place. The quiet solitude of that place was something I thought of today as we worked feverishly to get our books done to share with kindergarteners. For the past several weeks, students have been working in groups to create their own versions of "Panda Bear, Panda Bear, What Do You See?" Tomorrow is deadline day--the day that we share. I know that I will dream about the laminator as I sleep tonight. I felt like I was cheating during reading class today...students were working on their books, reading independently, or working on other assignments. Why did I feel like it was cheating? I didn't cover any content or put any objectives on the board. But there was real learning going on. Students have learned so much about working in a group, putting a project together, and using conventions. One of the great suggestions in Guiding Readers and Writers by Fountas and Pinnell is to keep a display of the texts the class has read throughout the school year. I’ve done this for three years now, and each year I find new connections and new uses for the display. This past year, I broadened my ideas of which texts to display. When I started, I only put up picture books. This year, I started including all texts, including the simple little stories, poems, and articles that I use for group instruction. In the early days of the school year, a Texts We’ve Shared wall is an easy routine that encourages participation. After we read a book together, I write the title on a piece of paper and give it to a student to decorate with pictures from the text. Once the student is finished, we hang the paper on the wall. By the end of the first week, we have a visual display of the learning we’ve done together. When we formally compare texts, looking at topics, author’s purpose, figurative language, and so forth, the Texts We’ve Shared display is invaluable. We can scan across and look for texts that have similar topics, similar writing styles, similar formats. We can talk about how texts can develop similar ideas in different ways. Because the titles of the texts are easy for everyone to see, we can get some great discussions going. For fourth graders, theme is a difficult topic. After we talked about some common themes, I had students refer to the Texts We’ve Shared display to try to match themes with the texts we have read. This led to an interesting talk about whether there are themes in nonfiction text, whether fairy tales have themes, and how one text can have multiple themes. We’ve even used another bulletin board to display common themes and show which stories depict those themes. My classroom has become quite the zoo. (As a colleague pointed out, it has always been a zoo, only now it has animals.) I’ve had to two toads residing in the classroom for a week, along with the tiny microcreatures that tagged along in their pond water. Water mites, aquatic worms, and the like—really neat looking under the microscopes. 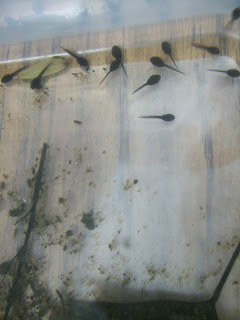 Today, a student brought in a jar filled with tadpoles. We think that there is also a fairy shrimp, but we’re not sure. “I just put the jar down in the pond,” he said, as we all looked in amazement at the twenty or so wiggling tadpoles. 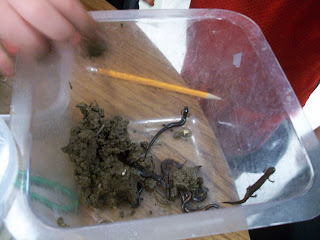 Another student brought in a plastic container filled with salamanders. “They were all in my garden,” she said. Well, it was a busy day. The students are working hard to finish their books to share with kindergarteners on Tuesday. But they couldn’t help but wander to the back of the room to gaze at the tadpoles. I couldn’t help to look in their direction, either. There was just so much to do! What kind of tadpoles are they? (Toad, I think, but I want confirmation!) What else is in there? How can I get kids to write about them? How can we share them with others? But I can’t do it all in one day. Patience! Tomorrow I need to try to get the rest of my classroom back in order. 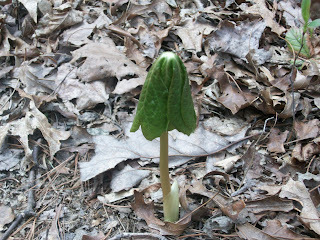 Mayapples are the coolest little plants. They start out as tiny green shoots, then open into green umbrellas. Around about now they start getting flowers. But it's been too rainy for me to venture outdoors to take pictures of them yet. It's been raining and raining for days now. A few weeks ago, while my student teacher was teaching full time, I had the chance to teach a reading lesson in every classroom in the school. My goal was simple: I wanted to test out lessons for having students read a text and write a summary in one or two class periods. In my classroom, I like to take a long range approach to summarizing, working on little bits here and there. But there are times when you need a shortcut to a good summary. Maybe it’s getting close to state testing. Maybe someone you work with has commented that your students really need to work on summarizing. You need to help your students write a good summary, and fast. My goal was to create a lesson plan that would be transferable to different classrooms, lead students to success, and highlight key points about summarizing. I got to try it out eight times in two weeks, which was amazing. I had the chance to work with a clean slate each time—fresh students, fresh classroom. Here’s where I started, and here’s where I ended up. With the two sixth grade classes, I chose a text on a completely new topic for them. (Actually, I wrote the text—“Find Out about Fairy Shrimp”) Before students read, we discussed schema and made a sample web to show how our ideas are related in a schema. Then, students read the text, creating their own webs as they went along. When they finished, I said, “What if there were someone who had no schema for fairy shrimp? When we write a summary, we need to think about our schema and the schema of the person who will read the summary. What information is most important?” After this, students worked with their partners to use their own webs to write their summaries. Their summaries were not bad. But I decided that this is not a transferable lesson. I worry that, when they read about topics that are familiar, students will add details from their schema to their summaries. Plus, students might be too tempted to add the seductive details from the text at the expense of the important ideas. So this was not the lesson. Next I moved on to fifth grade. Something that really bothers me about summarizing is that, often, there is no reason other than “because I told you so.” I decided to go with cute with the fifth grade, telling students that they were research assistants at a nature center. They had to read an article and report on its contents to the naturalist. The text for this was “How Do We See in the Dark?” After students read, they sorted strips of paper with ideas from the text into piles for “Important” or “Less Important”. This worked pretty well. 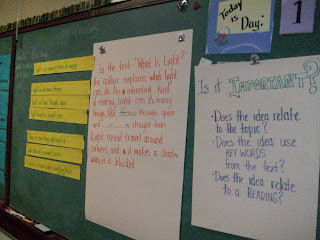 However, translating the ideas from the “Important” pile and into a final summary proved to be difficult for students. Some of them did not realize that they needed to organize the ideas according to the order of the text. Yikes! When I got to fourth grade, I figured out how to do it. First, I realized that it really needed two days. A lesson to get to a good summary simply can’t happen any more quickly. At the heart of this lesson is the idea of what is most important. To write a good summary, a reader needs to know what is most important in a text. But importance is a sliding scale. Readers often bring contextual importance to what they read. Details may be most interesting and important if they resonate with prior experiences. But for a summary, a reader needs to look to textual importance. I realized that this lesson needed to be very explicit with helping students to find out what is important. Is it related to the topic? Does it relate to a heading? Does it give new information about the topic? Writing the class summary: After we had sorted the sentence strips, I showed students how to reorganize the ideas to match the structure of the text. Then, we looked at how we could paraphrase the ideas by combining sentences to create a three-sentence summary. This was tough going for a lot of the students. Writing the independent summary: Once students had the important ideas, they were on their own to reorganize them, paraphrase them, and write the summary. And they weren’t bad. Finally! This lovely little ephemeral blooms for just a few weeks in the end of March and beginning of April, and then disappears. I found it just off where the Appalachian Trail crosses PA-34. 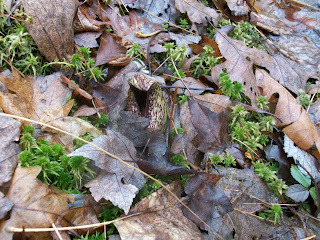 On this day, the sky was overcast, and there were few hints of green around besides the spring ephemerals. On this blog, I hope to share some of the learning, fun, and crazy schemes that go on in my classroom. 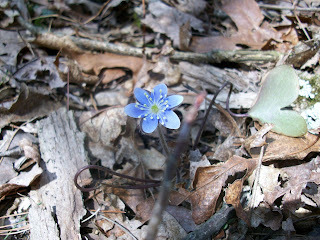 Oh, and some pictures of flowers. 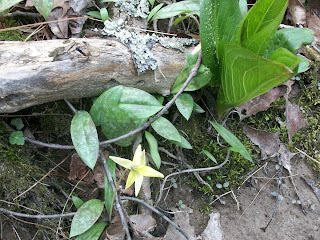 Trout lily is blooming on the left, right next to a healthy sprig of skunk cabbage.